Our planet is a phenomenal place full of magical mysteries, unimaginable displays, and bizarre occurrences. There are incredible natural phenomena all around our splendorous world. Sometimes, you just have to know where to look. The Cave of Crystals, or Cueva de los Cristales, is connected to the Naica Mine in Chihuahua, Mexico, and lies 985 feet (300 meters) below the Chihuahua desert. This cave was accidentally discovered 17 years ago by two brothers. The crystals in the cave are massive. Some of them reach lengths of 36 feet (11 meters) and the largest are over 500,000 years old. This is truly a magical site to see, but one that requires visitors to wear a special cooling suit, because temperatures can reach 58°C/136°F with 90-99% humidity; prime conditions for giant crystal growing. Bioluminescent dinoflagellates, a type of plankton, congregate in massive numbers in some special places around the world, including Costa Rica, Australia, Indonesia, Puerto Rico, Japan, and Florida. These tiny creatures spark bright neon blue, purple, or green as a defense mechanism or when they are stirred up by outside movement, such as a hand running through the water. The collective effect is magnificent and like something straight out of a psychedelic vision. When Lake Bailkal freezes over in the winter, the display of giant ice shards is quite mystical. Lake Bailkal is the largest freshwater lake in the world and holds about 20% of all the fresh water on the planet. The large pieces of ice that freeze on the surface of the lake are a piercing turquoise color and a gorgeous sight to see. The sailing stones of Racetrack Playa in Death Valley in California and Little Bonnie Claire Playa in Nevada are a geological phenomenon that is not yet understood. Stones dot the desert with long tracks behind them, which seem to imply that they have moved themselves across the desert floor. Some of the stones weigh more than 660 pounds (300 kilograms). There have been many experiments conducted and theories made, but no one is quite sure how these giant stones move themselves across the desert. According to the NOAA, only 5% of our oceans have been explored. The other 95% are full of beautiful mysteries and unimaginable natural phenomena. One such phenomenon was discovered off the southern coast of Japan. About 80 feet (24 meters) below the surface, exquisite geometrical designs were found, built into the sand. These patterned circles are perfectly symmetrical and rather complex. The artist behind the scenes turned out to be a tiny male puffer fish that works day in and day out for an entire week to create and maintain its circle as a grand gesture to attract a mate. Lake Hillier, also appropriately called Pink Lake, is in Western Australia, on Middle Island. It is naturally colored the hue of strawberry milk, and must be seen to be believed. This saline lake is as salty as the Dead Sea, and the pink color is believed to be caused by a strain of salt-loving bacterium. The color varies from season to season, but it is at its pinkest on cloudy days after a good rain shower. There are several other pink lakes around the world, including four more in Australia, one in Canada, and one in Senegal. There are several places to witness the iridescent blue glow of bioluminescent glow worms in New Zealand. These cave-dwelling worms paint a picture resembling a starry night sky on the ceiling and walls of the Waitomo, Waipu, Te Anau, and Kawiti caves. Most tours involve a dark guided kayak or rafting journey into the caves. 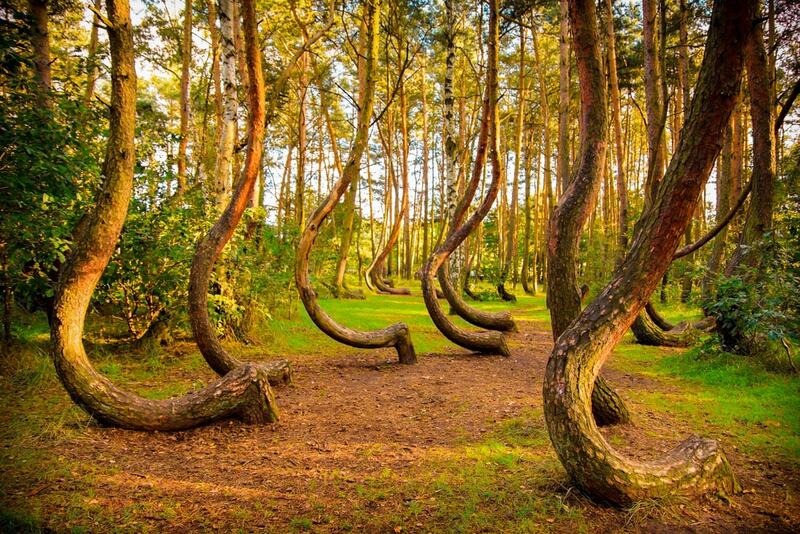 A group of 400 trees in Gryfno, Poland all have a bizarre C-shape to their trunks at the base. This phenomenon is a total mystery. There have been several theories, but no one really knows why all 400 of these 90-year-old trees all bent out before they grew up. A walk through these woods is a quizzical and captivating experience. You can’t talk about natural phenomena without mentioning the Aurora Borealis. The Northern Lights can be seen from multiple destinations, including Alaska, Norway, Sweden, Scotland, Greenland, Iceland, and Canada. In Finland, however, you have the option of staying in a private igloo-shaped cabin with a glass roof, and this really is the optimum spot to witness this spectacular sky display. The Kakslauttanen Resort is located 155 miles (141 kilometers) north of the Arctic Circle, where the Northern Lights are visible around 200 nights a year. The Danakil Depression in Ethiopia is home to the only blue lava volcano in the world. This phenomenon only occurs at night and is caused by the mixture of fiery flames and sulphuric gases that reach temperatures above 360°C/680°F. The resulting display of electric blue lava is truly out of this world.